NAZCA: An open air nautical university! 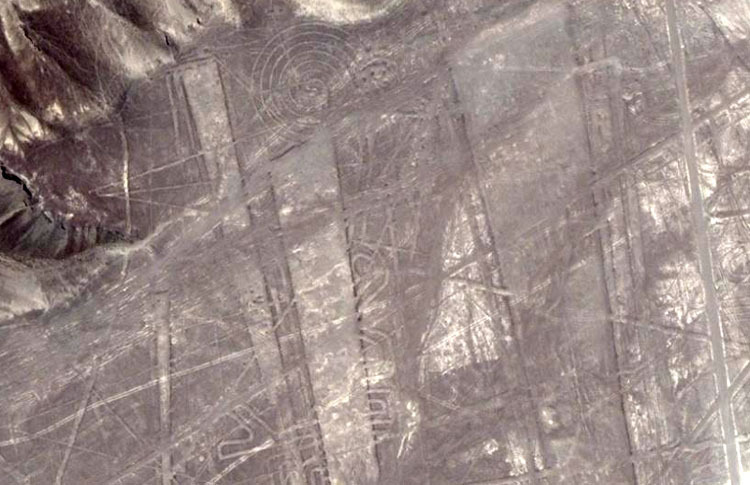 A vast tapestry of geometry, consisting of lines, trapezoids, rectangles, triangles, glyphs, cairn markers, mounds, etc., is etched into the desert Pampa near Nazca, Peru. The intricate design work covers a region of about 400-square miles, with yet further pockets of similar geometry being found beyond the main groupings. Some individual lines run uninterrupted for several miles. The Nazca geometry has survived, mostly intact, for potentially thousands of years because of the arid, rainless conditions of the high desert, with the result that the greatest destruction wrought has been in the past 50-years due to mindless vehicle and foot traffic crunching over the lines. In 1991 a fleet of 14 large wooden ships were found buried at Abydos, Egypt, eight miles from the Nile River. The ships ranged from 60 to 80-feet long and are known to be at least 5000-years old. The Abydos fleet was analysed, in part, by Cheryl Haldane, nautical archaeologist from Texas A&M University, who stated that, "they showed a high degree of technology combined with grace." Hancock wrote: "they were of an advanced design, capable of riding out the most powerful waves and the worst weather of the open seas." (See Fingerprints of the Gods, chpt. 45, pp 431 & 432). Pottery from Egypt, which can be dated to 3500 BC, depicts ships with sails and wall paintings in the Nile Valley, dating to 4500 BC show high prow, long sleek ships. One well preserved, heavy planked ship, attributed to the Pharaoh Cheops (circa 2600 BC) is 150-feet in length. We know that the Phoenician Round Ships were trading throughout the Mediterranean and into the Atlantic from at least 1300 BC and the Phoenicians maintained tin & lead mines in Britain or silver mines in Spain. Their ships were large, sturdy, ocean going vessels. "...about 220 of their ships, fully equipped and appointed with every kind of [naval] implement, sailed forth from the harbour, and drew up opposite to ours; nor did it appear clear to Brutus, who commanded the fleet, or to the tribunes of the soldiers and the centurions, to whom the several ships were assigned, what to do, or what system of tactics to adopt; for they knew that damage could not be done by their beaks; and that, although turrets were built [on their decks], yet the height of the stems of the barbarian ships exceeded these; so that weapons could not be cast up from [our] lower position with sufficient effect, and those cast by the Gauls fell the more forcibly upon us." 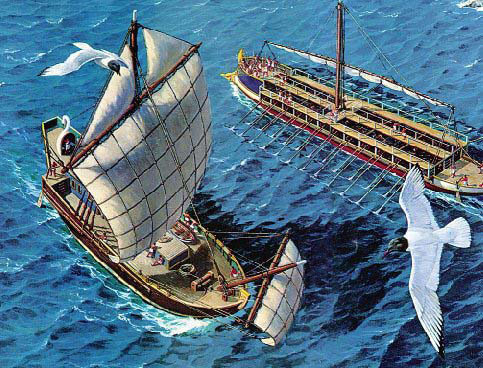 Caesar described the Gallic Swan ships of the Veneti (the Celtic Gauls-Britons, controlling the English channel and coastline of both France and Britain) as deep water vessels, capable of intercontinental voyages ... "vasto atque aperto mari" ... "upon the vast open sea" [where the Veneti were used to navigating]. See: De Bello Gallico, by Julius Caesar. One of about 220 Gallic-Briton Swan ships and other war vessels that came to do battle with the Roman biremes and triremes in 55 BC. If the wind on the day had not of died to nothing, within the narrow confines of the Loire estuary, the huge, sturdily-built Gallic ships would have won the battle. 'They hold aloof from war and do not pay war taxes; they are excused from military service and exempt from all liabilities. Tempted by these great advantages, many young men assemble of their own motion to receive their training, many are sent by parents and relatives. Report says that in the schools of the Druids they learn by heart a great number of verses, and therefore some persons remain twenty years under training'. 'They do not think it proper to commit these utterances to writing, although in all other matters and in their public and private accounts they make use of Greek characters. I believe that they have adopted the practice for two reasons- that they do not wish the rule to become common property, nor those who learn the rule to rely on writing and so neglect the cultivation of memory; and, in fact, it does usually happen that the assistance of writing tends to relax the diligence of the student and the action of memory...They also lecture on the stars in their motion, the magnitude of the Earth and its divisions, on natural history, on the power and government of God; and instruct the youth in these subjects' (see De Bello Gallico, VII, 15, 16.). 'The students at these colleges numbered at times sixty thousand of the youth and young nobility of Britain and Gaul. Caesar comments on the fact that the Gauls sent their youth to Britain to be educated... It required twenty years to master the complete circle of Druidic knowledge. Natural philosophy, astronomy, mathematics, geometry, medicine, jurisprudence, poetry and oratory were all proposed and taught-natural philosophy and astronomy with severe exactitude.' As her sources, Elder refers to: Strabo I IV, page 197. Caesars Comm. Lib V. Sueotonius, V Calegula. E. Campion, Accounts of Ireland, pg. 18.). 'The education system adopted by the Druids is traced to about 1800 BC when Hu Gardarn Hysicion (Isaacson), or Hu the Mighty, led the first colony of Cymri into Britain from Defrobane, where Constantinople now stands'. Further commenting on Hu Gardarn Hysicion, Isabel Hill Elder writes that he, 'is commemorated in Welsh archaeology as having made poetry the vehicle of memory'. Elsewhere she writes, he 'is said to have mnemonically systematized the wisdom of the ancients...'. She goes on to say, 'The published compositions of the Druids and Bards form but a very small portion of the extant remains of their works. The Myvyrian MSS. alone, now in the British Museum, amount to 47 volumes of poetry, in 1600 pages, besides about 2000 epigrammatic stanzas. Also in the same collection are 53 volumes of prose, in about 15,300 pages, containing many curious documents on various subjects...' (see Celt, Druid and Culdee, pages 54 & 55). Huge open air universities, like Avebury Henge and its many outer marker mounds, standing stone circles, etc., in the surrounding landscape, were where the thousands of students went to learn these scientific arts. By the time of De Bello Gallico (The battle of Gaul) there were already well-established maritime traditions, coupled with advanced expertise in shipwright skills and navigational techniques, spanning several thousands of years of accrued experience. "A true and valid similarity, however, may be found between the English Long Barrow series and early skulls from al'Urbaid in Sumeria, which, whether belonging to the fourth or third millennium B.C., are in either case older than their British counterparts. The only difference which prevents identity is that the Mesopotamian faces and noses are somewhat longer." (p. 112 of Races of Europe, Macmillian, New York, 1939). "It can be shown that Sumerians who lived over 5000 years ago in Mesopotamia are almost identical in skull and face form with living Englishmen and that pre-dynastic Egyptian skulls can be matched both in a seventeenth century London plague pit and in Neolithic cist graves in Switzerland." The "waymark trails" of this ancient exodus from Egypt and Israel, marked by standing stones, cairns, dolmens, mounds and stone circles, extends along the top of North Africa to the Pillars of Hercules, where the ancient migrants crossed the narrow Mediterranean straits to Gibraltar. The waymark trails further extend along the Atlantic coast to France and Scandinavia in the north and towards the British Isles to the west. Other trails, marked in similar fashion, extend to China and Korea (See: Palestine, by Major C. R. Condor, R. E. Phillip & Son, 1889 pp. 142-157; See also: Across The Jordan, by Gottlieb Schumacher, Richard Bently & Son, 1886). About the last fully European-Caucasoid nation left in the Eastern Mediterranean basin were the Hebrews (no relation whatsoever to the present day people who call themselves Jewish). The Hebrews, of whom the Phoenicians (ranging from their ports in Israel of Sidon, Byblos and Tyre, which are now a part of Lebanon) were a family or tribal branch, lost their entire kingdom between 720 BC to 586 BC to Assyrian and Babylonian conquerors. The Hebrew Phoenicians retained some outposts in Corsica, Sardinia, or Sicily, while other refugees escaped to Greece, Spain (Iberia, which means Hebrews) or Britain. They possessed yet other more remote outposts as well, far from the wars of the Mediterranean and many would have escaped to those locations as well. The last Hebrew Phoenician possessions were lost to the Romans during the Punic Wars (circa 264 BC. Note: "Punic" is Latin for "Phoenician"), wherein Hannibal ultimately failed to halt the Roman conquest. Left: An early Phoenician coin, showing a Phoenician galley ship. An expert on the subject of Phoenician history and shipwright states: "Nor were these boats tiny. The galley fighting ships, with their rows of galley oars, could have a crew of over a hundred people ... But even those were small compared to the Phoenician cargo ships with their vast, rounded hulls. These ocean-going ships were built for huge loads and long hauls. They made the extended trips from Mediterranean ports out to Cadiz, Lixis and other destinations on the Atlantic Ocean coasts of Spain and Morocco ... People have remarked that those cargo ships which sailed the seas for many hundreds of years B.C. were comparable in size to the ones Columbus sailed to America in 1492 A.D. Thor Heyerdahl, the modern-day explorer, noted that the Phoenicians could have sailed to Central America themselves ... well-informed people see it as being within the capabilities of Phoenician ships and navigators." (Sanford Holst, Cambridge & Boston Press). Right: One of several coins struck during the Punic (Phoenician) Wars, showing Hannibal's profile. Each varying coin shows a consistently remarkable likeness, although on some Hannibal's image faces the opposite direction. AN ANCIENT OUTPOST & CIVILSATION OF THE EUROPEAN-MEDITERANEAN COUSIN NATIONS. It is a well attested fact that the sea does not abide fools well, nor compensate for any lack of knowledge. Anyone who ventures out upon the vast, featureless ocean does so at their peril and needs to be both very well equipt and an adept navigator. 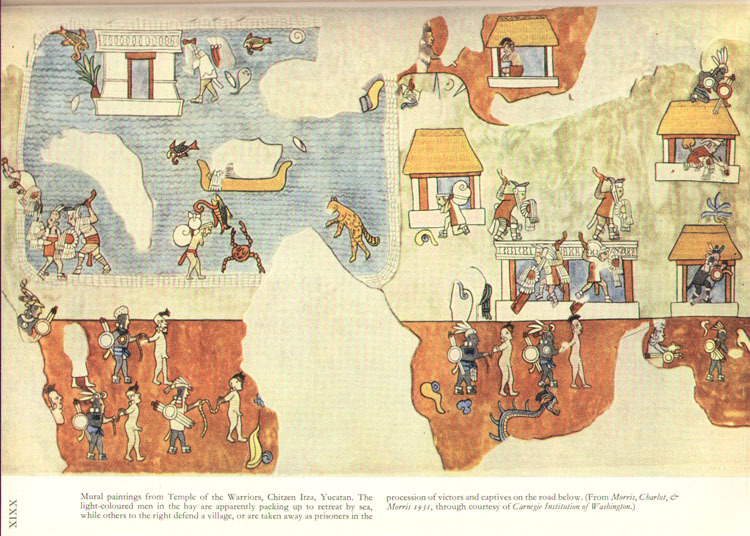 The fact that ancient Egyptians or Peruvians were sailing back and forth between the Mediterranean, Peru and Bolivia is very well attested, scientifically proven and beyond dispute, due to the excellent discoveries by German scientist Svetla Balabanova (1992) and two of her colleagues (See: Balababova, S., F. Parsche, and W. Pirsig. 1992. First identification of drugs in Egyptian mummies. Naturwissenschaften 79:358). Balababova positively detected cocaine (Erythroxylon coca) and nicotine (Nicotiana tabacum), which are solely South American alkaloid plants from Peru & Bolivia. The cocaine was ingested by ancient Egyptians as a sedative, probably by people suffering the pain of toothaches or to quell discomfort associated with injuries and debilitating illnesses in old age. The nicotine derived from South American tobacco was used as a body wash in the mummification process or for soaking wrapping bandages to kill the bacteria that causes putrification of tissue. In this usage the nicotine acted as a strong preservative. In support of all of the above, it goes unreported that tens of thousands of perfectly preserved mummies that have been recovered from Peru, Mexico, Bolivia and Chile, etc., are the remains of ethnic European Caucasoids with blond, red, auburn, chestnut-brown, dark brown and black hair. The hair itself is, on average, 30% thinner than that of present-day Indians and is often described as "wavy" (a unique European trait). In terms of physical anthropology, the mummified people have the longer face dolichocephalic cranial index, whereas the Indian populations are classified as, predominantly, Mongoloid physiology with the brachycephalic cranial index. The elaborately prepared mummies are of people of much taller stature than the average amongst the Indian populations and their blood groups are those of ethnic Europeans. 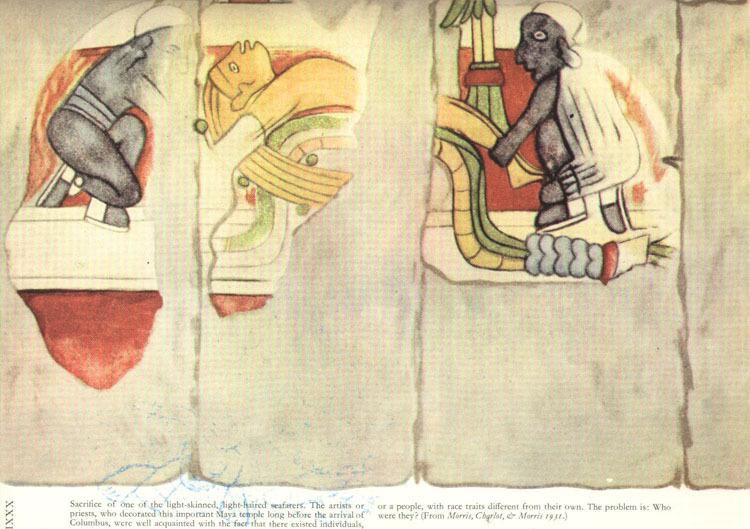 An ancient mural from the Temple of the Warriors at Chichen Itza, Yucatan, showing the fate of the early white population. Some are seen to be defending their cities, while others are loading their sailing ships to escape by sea. Captives, stripped of their garments are led away bound. The fate of many of the "Viracochas" was to die on the sacrificial altars of their captors. Aztec, Mayan and Incan oral traditions are replete with copious references and full physical descriptions of these ancient, white, bearded people who preceded them. Moreover, the artefact evidence left over from their epoch is found in large quantities. 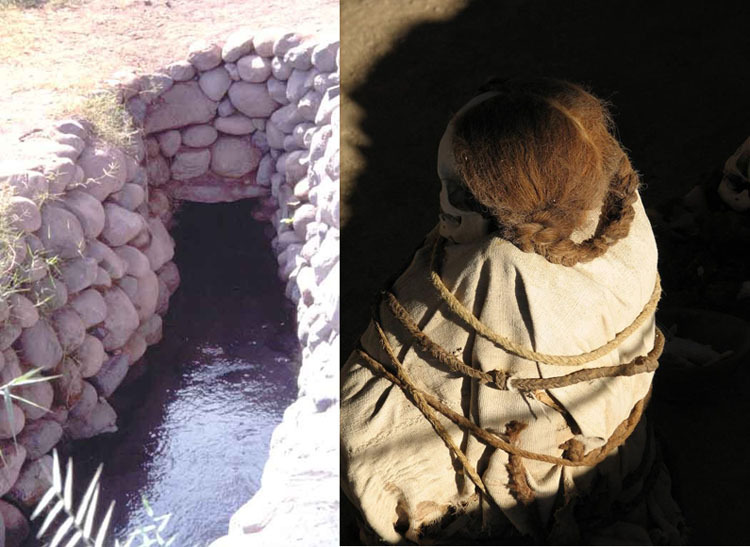 Before the Nazca desert region of Peru could be made habitable, to sustain the sizeable population that settled there several thousand years ago, over 93-miles (150-kilometers) of mostly subterranean aqueducts had to be dug. Along with these, there were 28 filtration galleries, some of which penetrate underground over two thirds of a mile into the hard conglomerate deposits and bring out 25 litres of water per second. The trussed mummy, with the very fine, auburn-red hair, seen to the right, is typical of the tens of thousands of mummies that have been found in the region. This reddish hair colour is found on only a very small percentage of the world's population (about 1-2%). The largest, present-day concentration of redheads in the world is in the United Kingdom, where 13-percent of the population has red hair and 40-percent carry the recessive red gene. Come and spread [within this region]. Grace. Go out [among the land] and become strong. Dr Winters further commented: "It would be interesting if this area was settled in the past and provided arable land and water for the ancient farmers".